Matt Lauer has been co-anchor of NBC News’ Today since January 6, 1997. He joined Today in January 1994 as news anchor. 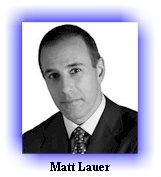 From September 1992 to September 1996, Lauer was at WNBC-TV, the NBC Television Station in New York. There he served as a co-anchor of the early morning newscast Today in New York from September 1992 until September 1994, and as a co-anchor of the early evening newscast News Channel 4/Live at Five from August 1993 until September 1996. He began substituting on Today as a news anchor in early 1993 before becoming the permanent news anchor in 1994. Jeff Yeager is the ultimate cheapskate, and the author of, The Ultimate Cheapskate's Road Map to True Riches: A Practical (and Fun) Guide to Enjoying Life More by Spending Less. Jeff is quite an incredible guy. He knows how to cut back on spending--bigtime! To save money, he'll filch almost anything, even airline barf bags. One great idea he talks about is a "fiscal fast" in which you don't spend money for one week. Now that's an awesome plan! You've got to wonder what would happen if you can do it. What will you learn about yourself and your spending? I'm going to give that a try. Check out his interview with Matt Lauer on Today. Click in the center of the video on the play button ( ) to start.